Chef Mario Batali and winemaker Joe Bastianich have brought straightforward, rustic Italian cuisine to the heart of the Las Vegas Strip with B&B Ristorante. Located in the the Venetian, this authentic Italian restaurant is the first of several successful establishments that this renowned team of restaurateurs have opened in Las Vegas. The food here echoes the soulful cooking of Italian mothers while incorporating a distinct modern flair, and the restaurant’s dark wood beams and Italian marble bar elude casual elegance. 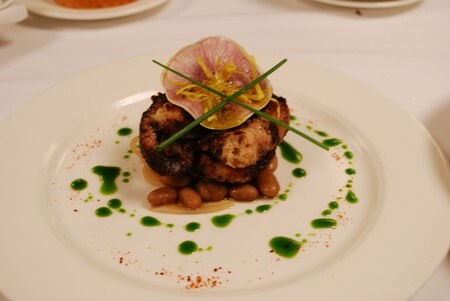 Try the Grilled Octopus with ‘Fagioli Marinati’ and Spicy Limoncello Vinaigrette appetizer to experience a perfectly tender taste of the ocean, or sample the Warm Lamb’s Tongue with Chanterelles and a 3-Minute Egg. Diners will surely find the Primi course to be very satisfying with decadent options like the Bone Marrow Ravioli and Spaghettini served with a One-Pound Lobster. 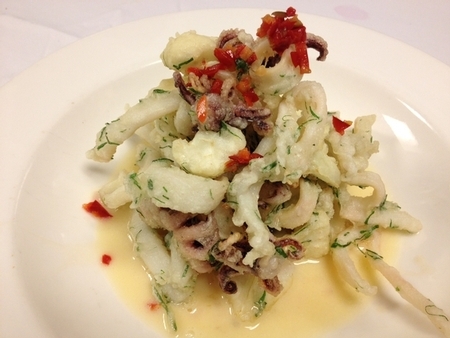 Secondi courses are just as tempting. Choices include the Veal Chop, Whole Grilled Branzino Fish, and a Grilled Ribeye for Two with roasted potatoes and Aceto Manodori; this is a great dish to enjoy sharing on a romantic date. Sample a glass of wine or two from B&B’s impressive list of over 1,000 wines from nearly every region in Italy. 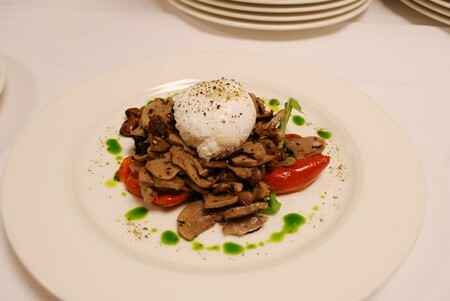 B&B Ristorante makes it easy for anyone to experience the charming cuisine of Italy during a visit to Las Vegas. It’s Venice. It’s Tuscany. It’s Piedmont and Sicily. It’s Roma and Puglia and Pisa and Sardinia. 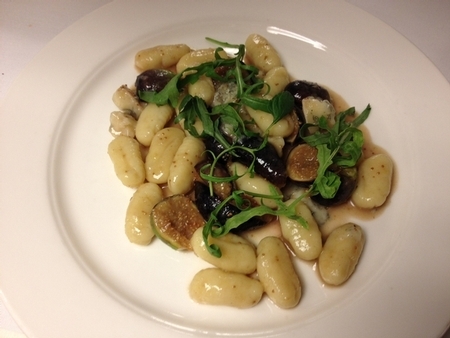 B&B Ristorante is Italian cuisine, the best of each region distilled into a restaurant. 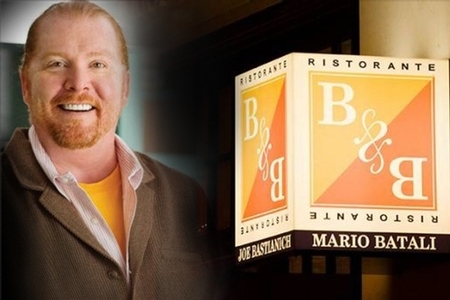 B&B stands for Batali and Bastianich. It is an interpretation of who they are and what they offer: a well-crafted mix of Italian food and wine culture. Joe Bastianich is known the world over for his knowledge of Italian wine, and Mario Batali is known the world over for his knowledge of Italian cuisine. Between the two of them, they have received six James Beard awards, including the Outstanding Restaurateur Award. Batali’s Food Network TV show, “Molto Mario,” was once required viewing for the aspiring home chef, and Joe has co-authored three award winning books on Italian wine. Bastianich and Batali have teamed up to open seven restaurants in New York, including Babbo, the original Batali and Bastianich restaurant, Lupa, Esca, and Otto. (It’s nearly impossible to get a table at any of them on a Friday night). In 2007, for their “Molto Vegas” experience, the B’s put together a winning combination of chefs, sommeliers, and management to make B&B Ristorante a paragon of Italian cuisine on the Las Vegas Strip. 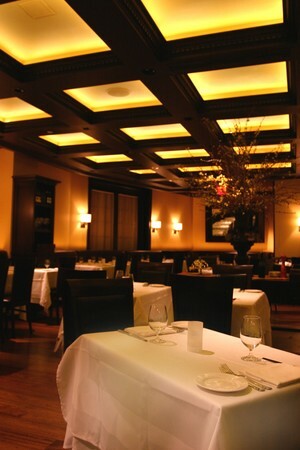 This is Babbo’s sister restaurant, and offers diners an overview of Mario’s career as a chef. So, with appetites at the ready, a good friend and I have decided to find out first-hand what the all the rave is about. Located adjacent to the Blue Man Group theatre at the Venetian resort, B&B is divided roughly into thirds. The hostess stands out in front of the restaurant, ready to greet and accommodate all who approach, but as we enter the dining area, I feel like I’ve walked directly into Batali’s brain-child, a secret place conceived through fervent thought and imagination. 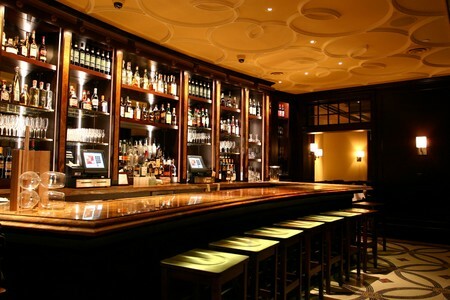 In the middle is a busy bar, which is flanked by two dining areas. 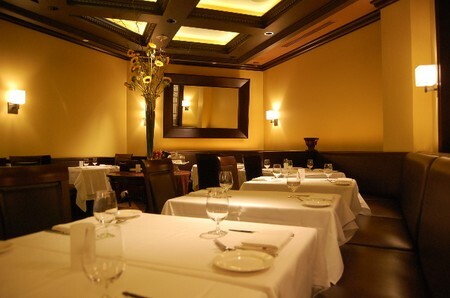 The restaurant is warm-toned, with rich, dark mahogany adorning the walls and ceilings. The colors and theme are masculine, yet cozy. Think Enzo Ferrari’s darkened billiards room, if you will. The fully equipped bar is classic. Three shelves of liquor are featured beneath a bright spotlight, which creates beautiful shadows on each tier, and bartenders are donned with standard, sharp attire: a vest, slacks, and a white button down shirt with the sleeves rolled up. The music leans toward soft-rock. Unlike every restaurant I have ever visited, B&B plays entire albums, start to finish. This evening, we shall be dining to the Best of Elton John, Vol. 1. I find this a refreshing change of pace from the “Top-40” or theme-music motifs of other restaurants. We are seated next to a small, private dining area, where walls laden with wine bottles are featured as decoration. In fact, as I glance around, I realize that B&B is full of wine. Wherever you look, there are bottles behind glass. It’s as if the back of the house is bursting with Barolos, and storage concessions had to be made. Seriously, there’s wine everywhere. The wine list itself is heavy, a cricket-bat sized guide of almost-completely Italian vinos. While there are a few token Champagnes for the bubbly crowd, this is a wine list that makes a statement: “We’re an Italian restaurant with an Italian wine list that will quite frankly take your breath away with its depth and range. Read this list and be educated. Remember thou art mortal.” (Say this in a “Wizard of Oz” voice, and you get the idea). Terra, our waitress and all-around menu expert introduces herself during “Candle in the Wind” and offers to help describe our tasting menu. We do not need much help because we’ve seen most, if not all of Mario's delicious cuisine during his many appearances on the Food Network over the years, so we decide to get the ball rolling with our first dish. 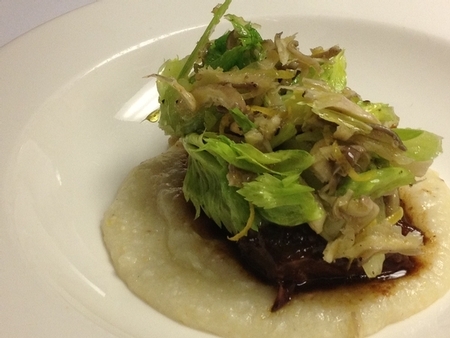 “Each dish on the dinner menu has five ingredients at most, making them simple and straightforward,” says Terra. She has been with the restaurant for several years and seems to be somewhat of an authority on all that B&B has to offer. She tells us that this is Batali’s style. He likes to keep his dishes as simple as possible, allowing the ingredients to speak for themselves. We start the experience with an amuse bouche, the Black Olives and Chick Pea Bruschetta, which is offered to every patron, compliments of Batali and Bastianich. The chickpeas are firm and mellow, while the black olives are tender, meaty, and bold. But the high quality extra virgin olive oil, just one of more than 15 different varieties available nightly, takes precedence on my palate. The toast has a slight crunch, giving a pleasant textural play to the experience, and the bruschetta opens the dinner on a tasty note before transitioning seamlessly into the next course. 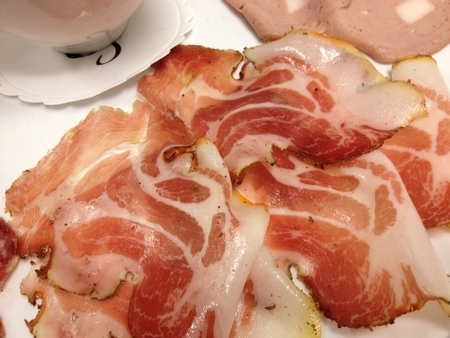 B&B’s Antipasti, or first course section, is chalk full of appetizing dishes that are both traditional and innovative. Heritage Pork Pate with Diane’s greens and crispy pork skin as well as Crispy Pork Totter with corn relish and frisee are a couple of examples that represent Batali’s cooking ethos down to the brass tacks. 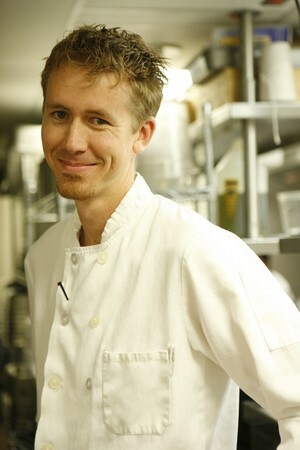 He finds success with simple flavor combinations and quality, locally sourced ingredients. Yes, locally sourced. As impossible as it may seem in the middle of a desert, the chefs are able to find the majority of the produce and meat they utilize from farms right here in Nevada. In fact, shortly after opening, B&B acted as a catalyst to start the very first farmers market in Las Vegas, where they purchase nearly all of their fresh ingredients to this day. 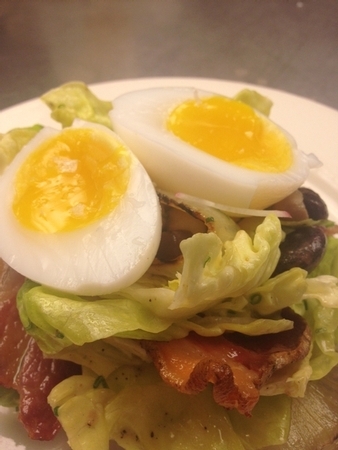 With this valuable resource, Batali is able to change the menu regularly. (By regularly, I mean there is something new on a daily basis). Next up, Terra brings a creation called the Cappellacci di Zucca, from the Primi section of tonight’s menu. Traditionally, the first course selections consist mainly of humbly portioned pasta dishes, a precursor to the larger main entrees, or Secondi, in the Italian dining experience. Every B&B Primi dish is designed according to this tradition, but each has an added flair from the hands of Chef Batali, like the Blue Crab Ravioli with lobster roe and tarragon or the Spaghettini with garlic chives, sweet garlic and one-pound lobster. Another exciting aspect of B&B is that many dishes on the menu have a unique story behind them, and the Cappellacci di Zucca is one of them. Terra explains that the term cappellacci is actually the name of a hat that many Italian farmers wore near the Po River. This describes the shape of the handmade, “hat-top” pasta. 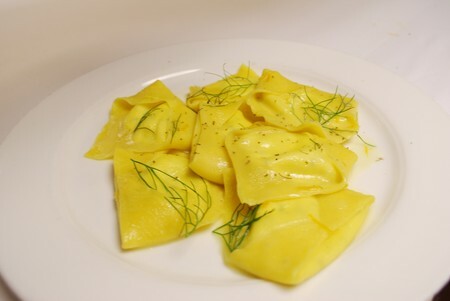 The zucca burro squash, stuffed inside the ravioli, also happens to be indigenous to the Po River valley. This is a prime example of the way that each different region of Italy inspires new and exciting culinary ideals within the restaurant. 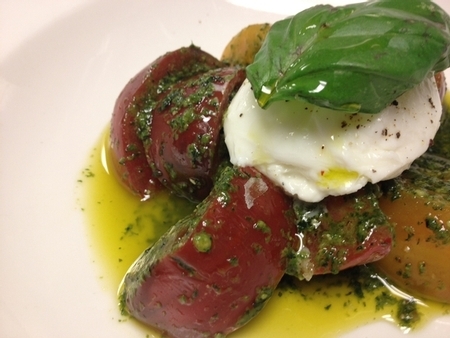 Batali strives to create dishes that not only taste like a part of Italy, but portray the rich history of the country for diners to experience through his cuisine. The Cappellacci di Zucca comes drizzled with rich and savory Luigi Gofanti butter, sprinkled with sage, and finished off with toasted almonds. Luigi Gofanti is the “cream-of-the-crop” as far as butter is concerned, and Terra tells us that it is the richest and quite possibly most fattening butter on the market. The sweet, creamy squash paired with this decadent condiment creates a culinary adventure filled with pleasant, savory notes, and the sage is present, yet subtle, which is surprising for such a pungent herb. Finally, the almonds add a bit of crunchy texture with their light snap. The balance of different flavors and textures is masterfully executed, and I would expect nothing less from such a talented chef. In between courses, the house sommelier, Pascel Bolduc, arrives at our table to share some insight regarding the 20-page wine list and offers his recommendation for the next dish. Aside from the Champagne, B&B’s wine list offers strictly Italian wines, which is quite a bold move for any restaurant. Pascel explains that expert wine maker, Joe Bastianich, wanted to represent the Italian table experience as authentically as possible. So, rather than straying from the mother land, he comprised a list of bottles that are comparable to many international varietals. This allows diners to develop a true appreciation for the culture and to experience a multitude of high-quality Italian wines that may otherwise go overlooked. There are over a 1,000 reds, whites and dessert wines to choose from, ranging back in time to some very popular vintages. Wine is available by the glass or by the bottle, and Pascel recommends a glass of Nebbiolo Piemonte, a red wine made in the province of Piedmont, Italy. A 2004 vintage, the Nebbiolo Piemonte emits hints of cherry and rose petals, which Pascel believes will balance well with our next two meat dishes, The Beef Cheek Ravioli and Grilled Pork Chop. It is refreshing to have a friendly, expert sommelier readily available to assist those less familiar with the world of wine. As he leaves to procure our wine, the Beef Cheek Ravioli with black truffles and crushed duck liver, another dish in the Primi section, comes out in all its glory. 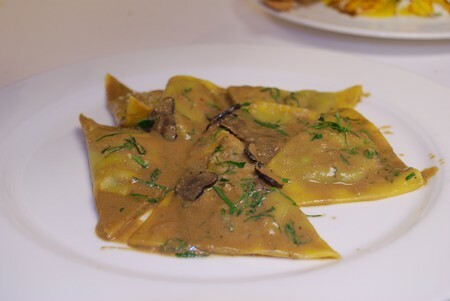 “If you had to choose one pasta dish that put Mario Batali on the map,” says Terra, “it has to be the beef check ravioli.” The sauce is a mixture of crushed duck liver and brown butter, and I notice several small slices of black truffle, which is surprising with such a decadent ingredient. I chew each bite carefully to note all the different parts of the dish. Each ingredient creates a fantastic flavor on its own; however, Batali brings them all together to create a dish that boasts bold, savory notes. The unmistakable addition of the black truffles pairs wonderfully with the rich combination of beef cheek and duck liver, and it is obvious that the pasta was made fresh. My plate quickly goes from full to empty, and I now have a clear understanding as to why the dish put him on the map. I place my utensils down and wait patiently for the secondi portion of dinner, the Grilled Pork Chop. Secondi, meaning second in Italian, is a meat lover’s paradise featuring a multitude of protein options from the sea, land and air. Guests can choose from dishes that are simple, but loaded with flavor combinations that are sweet, savory, salty or all of the above. Perfect examples are the Grilled Pork Belly with heirloom Savoy cabbage and apples, the Grilled Guinea Hen with roasted squash and fegola, and the Spicy Two Minute Calamari. However, this place truly stands out when it comes to their beef. B&B and Batali’s other restaurant, Carnevino inside the Palazzo, are the only restaurants in Las Vegas that dry age their own meats in-house. Dry aging concentrates and saturates the natural flavors of the beef for a specific amount of time, which creates more tender meat and new flavor combinations. The process of dry aging takes superior skill and knowledge, and B&B’s chefs have in spades. Terra tells us that Chef Jason Neve, Batali’s fearless understudy and culinary director for both restaurants, literally wrote the manual for in-house dry aging certification. Most impressive, says I. As scintillating as a quality steak sounds, tonight we shall enjoy the Grilled Pork Chop with rhubarb mostarda and mustard greens as our main course. The pork chop is brined for 24 hours with brown sugar and sea salts before it is cooked to a recommended medium-rare. This preparation technique encapsulates the juices of the meat without making it dry or tough. The pig is butchered in-house, and the thick fat cap is left intact on the chop throughout the cooking process. By doing this, the pork is infused with significantly more rich, savory goodness in every bite. As I take my first bite, I experience a more unique, buttery flavor than I am typically accustomed to with pork, and my heart nearly stops, in a good way, with every bite. I include a small piece of the fat cap with each piece of meat, and it melts on contact with my tongue. After trying the pork chop by itself, I begin to combine the different parts of the dish to create an experience filled with sweet and salty flavors. The chop itself is quite salty. However, the rhubarb mostarda tames the dish, balancing on a thin line between sweet and salty, and the mustard greens provide a crisp, palate cleansing effect. Overall, the Grilled Pork Chop creates a playful experience with the different ingredients with a delicious final result. For the closing act, Terra brings out the Vanilla Mascarpone Bruciato with blood oranges and an assortment of gelati, all made in-house. Bruciato is the Italian word for burnt, and it describes the flambéed outer crust which supports the luscious slices of red fruit. This dessert never leaves the menu, but the accoutrements change according to the season. This time of year, blood oranges are especially fresh, and Terra tells us that they make a near-perfect accompaniment to the burnt mascarpone. I combine the sweet, creamy filling with the blood orange’s deep, citrus flavor. The dish creates a balancing act of textures from the juicy meat of the orange, to the crunchy crystal-like crust, finished off with the smooth consistency of the mascarpone. It is light, fresh, and rich, providing the perfect sweet ending to our journey through the flavors of Mario Batali. Before we can truly call the meal complete, we must have one final drink. I sip on my digestif liquor, the Cardamaro Amaro, which was recommended by Pascel to settle our stomachs after the enormous Italian meal we’ve just consumed. As I sip, I recap the night’s epicurean journey. Tonight was a harmonious symphony of fine Italian cuisine. Mario Batali and Joe Bastianich have created a restaurant that mixes traditional Italian wines and principles with Batali’s new and innovative culinary philosophies. They create a balance between Old Italian charm and modern technique to generate an adventure filled with one-of-a-kind culinary creations to all who venture into B&B Ristorante inside the Venetian. I found just one flaw with B&B. After you pay your bill, after you leave the restaurant, after you leave the casino, you are simply not in Italy. You can’t walk off a few of the thousand calories you just consumed on a promenade in Syracusa. There is no granita stand selling scraped frozen coffee on the way home. You can’t meander to the Piazza San Marco and see what’s going on tonight. There’s no standing on a Tuscan balcony and watching the cypress trees sway in the moonlight. In short, if you’ve spent any length of time in Italy at all, this restaurant can make you travelsick, and I find myself wondering what a ticket to Milan costs on the way home. Insider Tip: In addition to an a la carte menu, B&B Ristorante offers multiple tasting menus featuring the chef’s favorites. These menus change regularly and can be paired with wine for each course. 7-course tasting menu. Requires the participation of the entire table. Price is per person and does not include the cost of beverages, tax or gratuity. Optional wine pairing available for an additional $75.00 per person. 6-course tasting menu. Requires the participation of the entire table. Price is per person and does not include the cost of beverages, tax or gratuity. Optional wine pairing available for an additional $99.00 per person. "The Small Bites of Venice"
I don't know what that guy bills problem was, but I had the seven course tasting menu and thought it was outstanding. I asked my waiter why they used spoons instead of those crummers, and he told me that joe bastianch doesn't like the server to take something out of their pants and rub it all over my table. Not a bad idea. And no he didn't put it that bluntly. 100 dollars for seven courses is pretty damn good if you ask me. Other restaurants have cheaper, but not for seven courses. That bill sounds like a real prick, maybe next time you should tell your waiter that you're not enjoying somethin so he can bring you something else. Rocket science I know. I told my waiter that I really wasn't enjoying my last pasta course of goose liver ravioli and he insisted I let him bring me another pasta. He brought me a beefcheek ravioli and it was outstanding. Thankyou for a wonderful experience. The atmosphere, the service, the drinks and food are outstanding! We really had a phenomenal dining experience and savor the memory of it. The pastas were ethereal, the lamb tongue I'm still dreaming about and the service staff was incredibly knowledgeable and professional. Normally I ignore feedback requests, but the evening was so special that it warrants my taking time to respond. Better first time I went. wanted this meal to be so good we forgot about wanting the service to be as good....which it wasn't... beet salad is exquisite. Lobster spaghetti is very very nice. Service is far too uptight for a place that decide to start playing Red Hot Chili Peppers an hour before closing just to annoye the crap out of their patrons.... too bad. The place is dark with deep dark wood tone andvthe sitting is very comfortable. This should have memorable. Very good wine list and BTW, Joe Bastianiche knows his wine... Unfortunately by the time we were finishing our food, we were I guess at the 2nd cd of The Chilies and we just couldn't bear it anymore. Go early. We ordered the tasting menu which incidentally is $99 rather than the advertised $85 on your site. This was 7 course meal of which 3 I would never eat again if offered. The starting course of Funghi Misti with pancetta was terrible. The mushrooms were bitter & the pancetta bland and unapppealing. 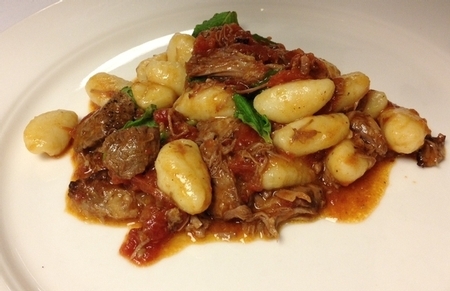 The second course of cavatelli with hamhock left me unimpressed as well with gristle left in the hamhock and a sauce which did not seem to pair well at all with the dish. Our waiter Eric R did not show until after we received our 3rd course. I believe he actually knew we were dissatisfied and avoided us. The bus boy came to clean the table of crumbs after the 2nd course as we sat with crumbs on the table for a full 2 courses. Additionally, he was equipped with a table spoon and a plate which took him about 3 minutes & totally interrupted our meal since B & B did not supply him with an inexpensive tool to pick up crumbs efficiently. Our experience was probably made worse by our expectation of a high quality great tasting meal. It was not.